Terriers are in Maine for a home-and-home pair against the Black Bears. The game will be broadcast nationally on NBC Sports Network with puck drop set for 7:30 p.m. Freshman Matt O'Connor (photo) will start in goal for BU. Assistant captain Ryan Ruikka moves back to the blueline and junior Matt Ronan takes his spot as right wing on the fourth line. In the one previous meeting this season, BU came away with a 1-0 shutout win behind freshman goalie Sean Maguire’s 28 saves and junior Garrett Noonan’s first-period goal. Sophomore defenseman Alexx Privitera, who received a game misconduct penalty during the Beanpot consolation game—his third ejection of the season—has been suspended by Coach Jack Parker for the balance of the season. ► Episode 17 of Inside BU Hockey features Bernie Corbett’s interviews with Coach Jack Parker, freshman forward Mike Moran, and ex-Terrier blueliner David Quinn, currently assistant coach of the Colorado Avalanche and former BU associate head coach. 2013 recruit Kevin Duane assisted on three goals in the Junior Bruins 6-5 win against Rochester. The 6-4 right wing has 22 points in 21 games since joining the Bruins. 2013 recruit Brendan Collier scored a pair of goals for the Junior Warriors in a 4-3 win against the Islanders Hockey Club. The former Malden Catholic captain has an 11-24-35 line in 39 games. Colin Wilson’s 4th goal of the season on Tuesday night was the only score in Nashville’s 1-0 OT win against San Jose. NHL.com feature on Kevin Shattenkirk emerging as a top young defenseman in St. Louis. Nick Bonino, who scored his first NHL shootout goal last week, had another in Anaheim’s 3-2 win against Chicago. Bonino also added an assist. 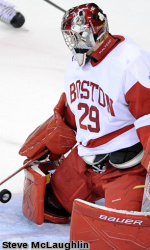 Former Hockey East and BU MVP John Curry has been signed to a PTO by the AHL Houston Aeros. He had been playing for the ECHL Orlando Solar Bears. Earlier in the week, we noted that former BU co-captain and U.S. Olympic gold medal winner Mike Eruzione was featured on the Madison Square Garden series, “The Game 365.” The program, which features a tour of Agganis Arena, will be repeated several times this weekend. Schedule.